Hi. Love it. Wher did you get the treat bags and tiaras? Beautiful table. Any clue on how to re-create? Hi Angela, I bought packages of crowns in different color, and each package only brought 2 blue ones...So I purchased 12 packages..to get 24. :)..
Hi Joanne, there's so many details involved in that set up. We used blue and white plates, blue boxes and displayed the crowns on top of them. The blue fur ball, is a pen..the "pretend" snow is glittered foam...you can get regular children's chairs and cover them. I'm sure your party will be beautiful..just one thing at a time. Spend lots of time..looking for BLUE & SNOW. Hi there! Beautiful party! Perfect ideas for my daughter's 4th birthday! I'd love to know where you got the images for the blue party boxes. They seem pretty high quality and they really make the table! Hi Valerie, I purchased them Downtown, L.A., they were ordered as invitations, and apparently, never picked up. Just got lucky...I guess. Where did you buy the tiaras, table cloth and runner? We have having a Frozen Movie Party. I love your Party Pictures!!! You did an amazing job! Hello Lonnie P, I bought 10 dozen packages of crowns, only 2 blue ones in each package, in order to get the 20 I needed. The linen I had made. Thank you so much, I enjoyed it very much. 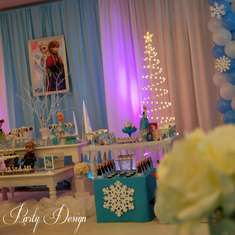 It's a beautiful theme...Enjoy your Frozen inspired party ! Beautiful theme party. 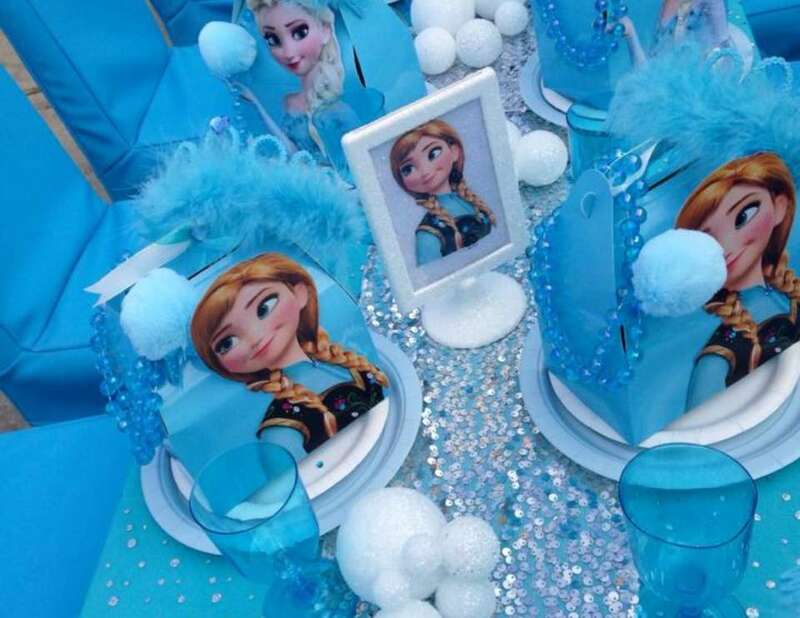 I am trying to help out my cousin set up her frozen theme party and we don't know where to start. Is there a way I can contact you and we can discuss the possibility of renting your party table cloths, etc...?? Hi Sally sure, we have a store in Downey, California. Please visit our facebook page Pinatas Couture. Best of luck with your party! Beautiful decorations!! I would love to know how you made or where did you get the centerpieces? 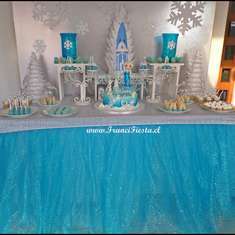 We are planning a Frozen theme party and those would be great... Thank you!! I may interested in renting the table cloth and center pieces as well. Do you ship to Florida? Also where did you get the character cut outs? Thank you so much ladies, I had so much fun putting it together. Erica T. I bought those already made. You can also buy the doll at the Disney store, and use them as center pieces..they're adorable! Christina P the table covers I had made. I bought the material for 4.99 a yard, and had the runners made for 13.00 each. Stephanie V, we don't ship out, I'm sorry, but I'm sure you can find a pretty material to put over regular table cloths..to dress them up. Best of luck with your parties ladies..Enjoy! Where did you find all the cutouts for party? where can i found the cut outs !!! Beautiful Creation!! My two girls have asked to combine their birthdays to have a frozen themed party. I am so thankful that you shared these beautiful photos for inspiration to the rest of us. Please let us know where to find the cut outs because they are gorgeous!! Hibba, they were not purchased online, although I'm sure you can find tiara's there. I buy 10 packages just to get 2 blue in each one.. 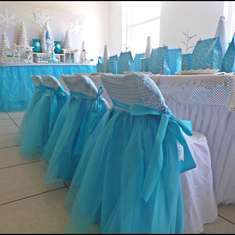 Thank you Lisa, we have them at Pinatas Couture, you can rent the entire set up..located in Downey, California. Thanks and best of luck with your party. Hi Bern M, that's a favor box with a blue crown with fur, the blue snow ball is a pen, and a fancy neckless on each box. Inside party favors. Hi Rose, I believe it's called Fiesta Mex, there are so many places here, that sell party stuff..you can find something cute in any of those stores. Just have to say what a lucky girl. Well my party would not be so large but I would love to miniaturize. 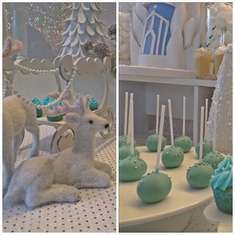 This set up... Just simply a wonderful Frozen theme . Where did you get the circle centerpiece? Did you make it, if so can you tell me how?